Raspberries are rich in vitamin C, B vitamins, potassium, magnesium, manganese, iron, folate, etc. It is loaded with antioxidants and essential fatty acids. Of the different varieties of this fruit, red raspberries are considered the best. Thus, regularly eating about a cup of red raspberries can prove to be highly beneficial for your skin and overall health. It boosts immunity, improves allergic reactions, reduces the risk of age-related macular degeneration, promotes digestive function, increases the rate of metabolism, facilitates weight loss, and supports healthy blood flow. 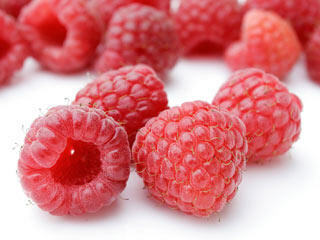 Raspberry helps protect against certain types of cancers, too. Moreover, you can apply this amazing fruit topically to heal sunburn (it has tannins), repair sun damage, fade age spots, reduce wrinkles, and derive other beauty benefits. It works as a particularly good anti-aging agent. Besides, you can include organic red raspberry seed oil in your beauty regime. You may also prepare raspberry face masks by making use of fresh red raspberries. In case you do not have fresh one then you may use frozen raspberries. • Take half a cup each of red raspberries, rolled oats, and organic honey. Blend all the ingredients together in an electric blender or food processor. Spread the resultant puree on your face and rinse it off after 15-20 minutes to exfoliate your skin and get rid of acne. • Another similar beauty-care recipe involves using a combination of half a cup of red raspberries, and two tablespoons each of organic honey, oat flour (blend rolled oats in a blender to get oat flour) and heavy cream. You may also add half a teaspoon of rose or lavender essential oil in it. Regular application of this facial mask rejuvenates your skin, heals wrinkles, and gives a healthy glow to your skin. • When dealing with oily skin, blend a cup of plain yogurt and half a cup of red raspberries, apply this mixture on your face and wash it off after about 10-15 minutes to nourish your skin. You may also add ground oats in this recipe to slough off dead skin. Here’s a video showing how to make an oatmeal and raspberry facial mask. • Make a homemade clay mask by mixing half an ounce of Neroli Hydrosol or Orange Blossom Hydrosol (works as an excellent facial toner), one-eighth ounce of red raspberry seed oil, a tablespoon of honey, and two tablespoons each of pink Kaolin clay and organic red raspberry seed powder. Gently massage this smooth paste onto your face and neck. Finally, rinse it off after 10 minutes and follow up with a toner and moisturizer. Use this beauty treatment one or two times in a week to maintain smooth, younger-looking skin. • Pour five cups of boiling water in a teapot and steep five red raspberry leaf teabags in it for about 20 minutes. You can use this herbal tea for facial steam. • You can prepare an organic body scrub at home by making use of raspberry seeds that are sieved out when making raspberry puree. Blend raspberry seeds in a blender and add half a cup of extra-virgin olive oil, four cups of granulated sugar, and half a teaspoon each of lavender and grapefruit essential in the mixture. Apply this recipe on your skin about once in a week to exfoliate your skin and reduce wrinkles and blemishes.